In the interest of full disclosure, an uncle of this reviewer was present at Iwo Jima during the course of the main invasion and fighting there. However, this volume does not cover that particular part of this well-known and especially bloody battle, fought in February 1945 primarily to provide an emergency airfield for damaged or low-on-fuel Allied aircraft on combat missions to Japan. The human interest story it does tell is that of a little-known pre-invasion operation, two days prior, by a flotilla of Landing Craft, Infantry (LCI) turned Navy gunboats which had been ordered to deliver and cover an intelligence gathering mission by one of the storied Underwater Demolition Teams (UDT), the so-called frogmen. Specifically, this story is about LCI-449, its crew and the ordeal experienced during its Iwo Jima mission. 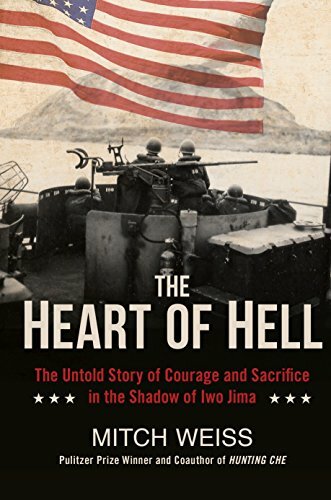 The book comprises three parts: The “Pre-Mission” lays the groundwork for the introduction of the officers, crew, how they came to find themselves on LCI-449 and the boat’s pre-combat experiences. “Operation Forager” recounts the crew’s baptism of fire in the retaking of the Mariana Islands: Saipan, Guam and Tinian. “Island X,” of course, is the climax. The character development throughout the book, by Pulitzer Prize winning author Mitch Weiss, is central to its story. It gives an inside look at who these young men were, where they came from, their experiences, their attitudes, fears, and feelings as part of the big show, not just in the Pacific but in World War II as a whole. The reader really gets to know these young men, many of them just teenagers. The importance of this character development cannot be overstated when one finally reaches the climactic operation which demonstrates the courage and sacrifice referenced in the book’s sub-title; courage and sacrifice were hallmarks of the Greatest Generation. Additionally told is the story and description of their home, LCI-449, with many of the technical, engineering, and weaponry details included in order to familiarize the reader with what was not usually considered a glamor assignment in the wartime Navy. Most sailors generally expected and wanted posting to the more glorious and impressive fighting ships: the aircraft carriers, battleships, and cruisers. In any event, the smaller ships of the fleet had their own individual purpose and necessity for being. In the case of the LCI, if they weren’t participating in the delivery of invasion troops to the beaches then they had been modified as gunboats to provide close-in support to the troops with their weaponry (20mm and 40mm cannon as well as rocket launchers) thus putting them much closer to the enemy and harm’s way. Although there are no notes, considering the book’s rather intimate and close up look format, it is evident from the bibliography that Weiss made the most of many interviews with surviving crew members, their families, and their letters. Indeed, the author, a journalist in military affairs by trade, wrote this story after being contacted by a grandson of one of the survivors who wanted to know about his grandfather’s service. Newspapers and periodicals, books, archives, other official documents, and interviews with crew members of other LCI and eyewitnesses present were also employed to provide this personal, in depth account. Helpful, as well, is the inclusion of a cast of primary characters: Officers, crew and those waiting on the home front along with a glossary of naval terms which, again, provide familiarity and context for those who lack such. Inasmuch as this book is recommended and, therefore, should be read, forewarned is forearmed. Needless to say, the resulting depictions of casualties in combat are quite graphic with all that that involves. On the other hand, the reader can also get caught up in the personal side of the account, to the extent that one might become somewhat emotionally involved, hoping that each man will survive the crucible of the final mission yet realizing at the same time that that may not be the case ultimately. Needless to say, this is a well written, vivid account of a little known episode in World War II in which the men and women involved are the story. Their dedication and commitment to their ship and, most importantly, each other is an object lesson for those of us who have come after. We must always remember the courage and fortitude necessary to sacrifice for the greater good.